Why Use Leech Therapy to Treat Arthritis? Arthritis is one of the disabling diseases of the joints that affect not only the physical body but the quality of life as well. Chronic arthritis of a joint can cripple an individual, especially if it affects weight-bearing and multiple joints. There are many medications available to relieve pain and swelling, but sometimes this is not enough. Likewise, there are also many treatments available such as heat treatment and cold therapy to assist in the symptoms of arthritis, but these do not in fact reduce the pain on a long term basis. One of the oldest and most therapeutic therapies for this condition is leech therapy. The FDA approved the use of leeches in the USA in 2004. In October 2005 the first American hospital 'Beth Israel Medical Centre New York' offered Leech Therapy to treat Osteoarthritis of the knee. The use of leeches is one way to treat a multitude of illness and disease. Leeches have found their niche in the medicine world and serve many purposes and are commonly used as a management for blood clotting problems and are effective in many areas. Their saliva releases substances and chemicals that can help decrease the inflammation process, thereby decreasing the pain one feels in an inflamed joint. Leech Therapy also provides additional natural benefits to patients including high energy and concentration during the day as well as a peaceful deep sleep at night. Our joints need synovial fluid to move freely and pain-free. The articular surfaces of bones making up a joint are lined with lubricating membranes. Small membrane sacs, or bursae, occur in the space between the bones of most joints. These membranes lining joints are known as synovial membranes because they secrete synovial lubricating fluid. People suffering arthritis have less synovial fluid, causing pain on movement. The edges of the bones as well as the cartilages also deteriorate, adding more tenderness to the already painful joint. This causes inflammation due to tissue damage and prolonged, untreated arthritis can lead to deformities. How Can Leeches Help With Arthritis? The leeches' saliva assists in the treatment of arthritis. There are many substances and compounds in their saliva that reduces inflammation in a joint, some of which are the compounds that are called bdelins and eglins, acting as an anti-inflammatory. Aside from anti-inflammatory components, their saliva also has an anesthetic component that deadens the pain felt in the joint and also has a histamine-like substance that acts as a vasodilator. Acetylcholine, another component of the leech's saliva is also a vasodilator. This is important in the treatment of arthritis because when the vessels dilate [expand], it increases the flow of blood, thus, washing away the compounds that cause pain and inflammation. There are approximately 600 species of leeches known worldwide and only 15 species are considered as medicinal leeches and used for arthritis and other treatments. The arthritic joint is first cleansed before medicinal leeches are placed on specific areas relating to the problem. This is a simple and natural process and feels similar to experiencing a mosquito bite as leeches release a natural anesthetic. The Leech has a natural process that removes infected blood and at the same time, releases therapeutic components and enzymes from its saliva, allowing these components and enzymes to work their wonders in reducing inflammation and pain in the joint. Medicinal leeches remain attached to the patient for approximately one hour [times can vary] before they automatically disengage. Through the entire process, patients feel relaxed. The area is then cleansed and dressed. 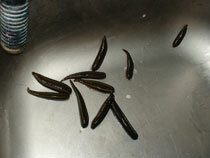 All cases are individual, but on average, medicinal leech therapy is usually repeated if necessary every 6 to 8 months. Improvement in joint pain and inflammation will be noticed the following day after Therapy. Not only is it a safe way to treat arthritis, but it has been a universal treatment for centuries.